Things have been a bit quiet around here. I have a post about science-fiction taxonomy and seagulls to write, another about why the 'Hard SF' subgenre is no longer relevant, and so on, but right now I need to get some work done. First, there's the ongoing novel. I'm nearing the end of the second draft now. Usually, the first draft is a race to get the story - the sequence of events - down; the second attempts to get the narrative sorted out - how those events relate to each other, how they're told and shaped, and the voice in which they're told. (The third draft will try to make sure that every sentence is the right shape and logically follows from its predecessor, but let's not go there yet.) Getting the voice right is pretty important as there are two protagonists; getting the structure right is tricky, as one story begins before the other kicks in and the first catches up with the second as they're told in alternating chapters. 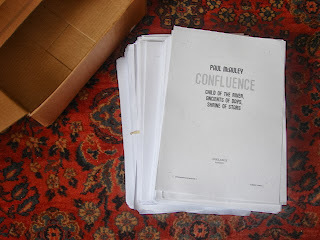 - the proofs of the Confluence omnibus - three novels and two stories, 940 pages. It's due out in February next year by the way; my publishers and I decided it would be a good idea to put a little distance between it and Evening's Empires, and I don't have anything else coming out in 2014. In the morning I'm working on the new novel, and in the afternoon I'm reading every. single. word. of the proofs, and in the evening I'm working on a couple of other small tasks. So for the next couple of weeks, not much time for much else.